A photo atop one page in the ePortfolio of Matthew Grandon ’12 shows him speaking with Mikhail Gorbachev during the former Soviet premier’s visit to Lafayette in late October 2011. Other webpages Grandon built during his time at Lafayette as part of his online learning scrapbook list courses he took, such as Spanish 211. The courses include blog entries that give a view of Grandon reflecting on what he’s learned. Reflecting, making mental connections among courses, thoughts, experiences, and possible career moves. Grandon, who went on to obtain a master’s degree in higher education administration from Harvard and today works at University of Pennsylvania, was the first at Lafayette to use LaFolio—an innovative approach to education that invites self-analysis through careful reflection. Grandon says the system helped him learn to speak about his education and to evolve—a skill that enabled him to get into grad school and become a better leader in his field. 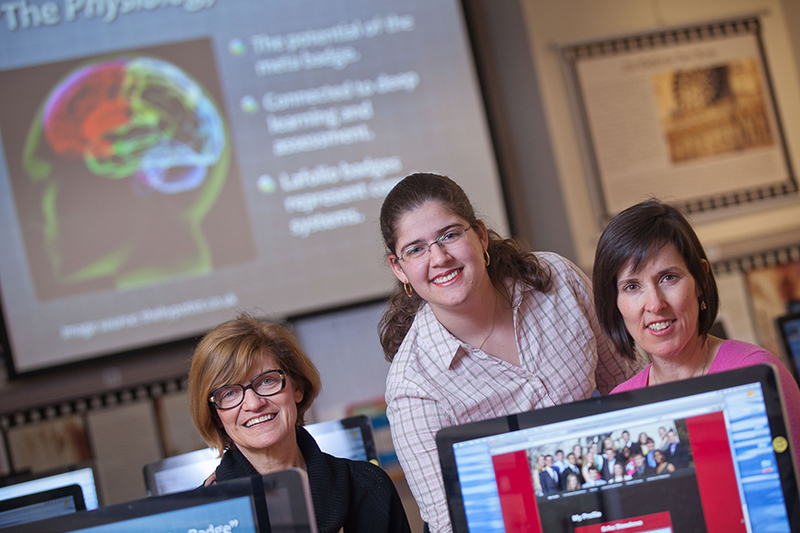 Proponents of LaFolio, such as Mary Toulouse, director of the Foreign Language Resource Center, say Lafayette’s ePortfolio moves students away from discipline-specific tests to building broader bases of knowledge and encouraging a stronger understanding of how various classes and experiences relate to one another. The American Council on the Teaching of Foreign Languages agrees with her. Recently, Toulouse won the group’s 2017 Cengage Award for Excellence in Foreign Language Instruction Using Technology. From Grandon’s initial use (one other Lafayette student had beta-tested a portfolio system using a different kind of software) five years ago, today there are 1,800 electronic portfolios in various stages of development. Progress is marked through badges students earn for their portfolio work. Students who prove mastery of skills to match certain criteria, such as demonstrating a deep understanding of reading and listening in a foreign language, can earn mini-certificates or badges. There are eight, from i-Lingua, Communicative Competence in Modern Languages, to i-Lead, Leadership: Civic Engagement. An ePortfolio’s scrapbooking approach to learning, in addition to promoting critical thinking, produces a tangible end result—a résumé on steroids. ePortfoilios can be used as tools for job seekers. Telling more than a transcript or résumé, an ePortfolio can demonstrate how well a student understands a subject and how he or she applies that knowledge. While LaFolio work is completed by foreign language majors, it’s also being used across other majors, involves social work and community activism, and even extends beyond Lafayette itself. Eunice Geronimo ’19, a double major in anthropology & sociology and Spanish, used a similar system in her middle and high schools. She was required to produce portfolio presentations using PowerPoint, where she’d demonstrate how she could connect her lesson to a specific social justice issue. Lafayette’s ePortfolio is more advanced and robust than her public school work, Geronimo says. Instead of simply reporting on what she’s learned and making connections, she is part of a social network. She can learn about courses other students have taken and build upon the knowledge of her predecessors. Geronimo is the first Lafayette student who enrolled with a seal of biliteracy. Twenty-five states in the U.S. are requiring students to demonstrate a fluency in a foreign language and obtain the seal to graduate. Eleven states are in early stages of developing their own version of the program. Toulouse believes the College’s LaFolio system could become the new standard to help students obtain the seal of biliteracy. Already some states, such as New York and California, are using portfolio-like systems similar to what Geronimo used.